Pictured: Left, Kristen Chapman Gibbons. Right, “Rise” artist Nina Covington. Nina Covington and I are friends. Both artists living and working in Nashville. Both doing deeply personal and feminist work. And in different mediums, completely independent of one another, we both released work that seemed to be in conversation. In some ways, we have been in conversation, but not specifically about our work. We both come out of and through trauma. We are both managing the daily impact of what that means for our health, for our relationships, and for our creative expressions. What follows is the documentation of a process so intimate, we rarely speak of it. The process of the recovery of voice. What you see in both of our stories is not our “damage” alone, it is the determined and intentional way we’ve displayed the pieces. 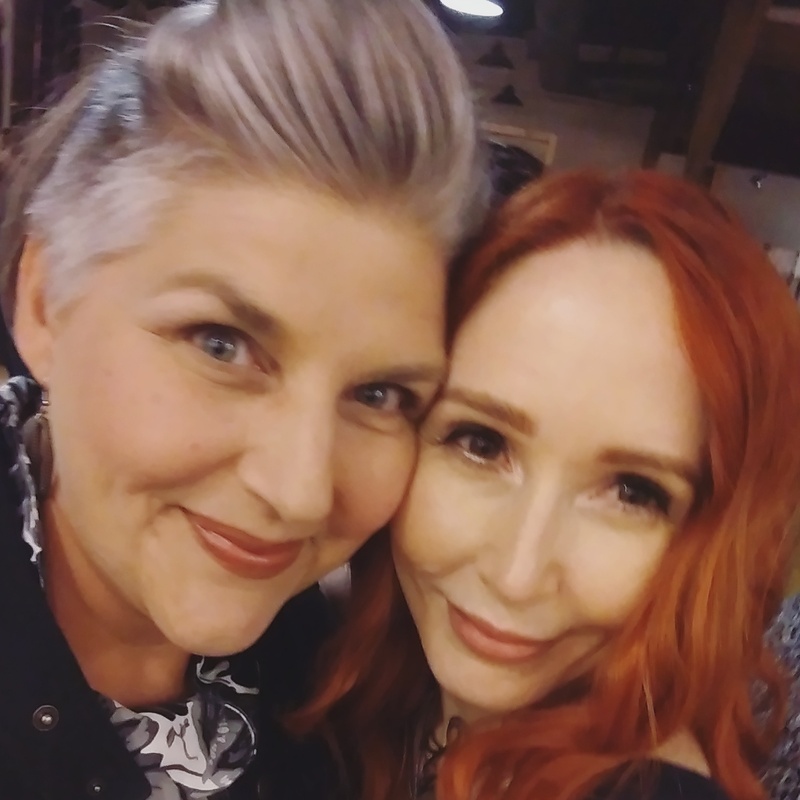 I recently attended her exhibit, “RISE” at abrasiveMedia and was struck by how we both exhibited work, within a week of each other, that we had never spoken about, that is remarkably similar. There is scant research and information about what it is to manage trauma over the course of one’s life. Here’s what I know: going to your darkest places to make art is risky and deeply rewarding. I tell true stories from my life and help other cultivate their own stories. I told my twentieth story, “In A Tiny Office,” with Tenx9 Nashville at Parnassus Books, in an event co-sponsored by The Porch, on August 28. This story took thirty years to tell or rather, it took me thirty years to find the courage to tell it. It is the story of the day the abuse in my home was no longer a private matter. The day someone taught me to fight back. I had to read it aloud a dozen times before I could read it without crying. It is abjectly terrifying to say out loud the things you were always supposed to lie about, to own what they mean, to reject the shame that comes with remembering. I avoided the vulnerability that truth-telling brings for decades. And yet, once I voiced those words out loud, in front of a crowded room full of people, I felt as though a splinter made of glass had finally made its way out. The thing about splinters though, is that they can do damage coming out. Trauma is like that. You have to be careful trying to remove it, lest you cause more harm. You are going to bleed more in the process of healing. Sometimes making art is painful. And for those of us in trauma recovery, it can be dangerous. There is a cost to being so public with your private pain. But, there is a bigger cost to silence. Nina’s work tells me that she knows this all too well. It was such an emotionally powerful experience for me that I came back to spend time with it later, without the bustle. To be honest, I didn’t want to process it in a crowd. The exhibit is a series of mixed media pieces, with text by Nina. They follow the path of a young girl, forgotten and unseen who becomes different versions of herself, some more powerful than others, arriving at radical acceptance. Nina plays with themes of concealment and exposure, power and vulnerability, separation and connection, and the hazy states of being between then and now. Living with and managing trauma can feel like a full-time job. It is a daily negotiation with yourself, asking, “Who is chairing this meeting? Me or my trauma?” It is an uneasy intimacy with shame. To create work that documents these internal conversations is to have these conversations in public. And in Nina’s case, sometimes without clothing. In articulating the fog of recovery and the jubilance of rebirth, Nina creates a space for all the phases of healing. Not just the pretty parts. In my own story, I needed to pay tribute to the woman who gave me words I desperately needed when I was seventeen. I also needed to remind myself how long I survived without them and what it costs to keep quiet. I was that terrified girl. I am the woman, standing with her shoulders back, speaking the truth of my life. But, much like Nina’s subjects, none of these states are permanent. I am always in between who I was and who I am. What was done to me and what I choose for myself. What to hold back and what to shout from the rooftops. When to reach out and when to hide. To heal, you must get very good at navigating the in between, because you are never done getting better. Nina and I both agree that the photo,“Wait For Me,” of the little girl, is almost impossible to look at. It cuts too close. But, you cannot tell the story of transformation unless you start from the beginning. It doesn’t matter if I see a prince, if I don’t first know he was a frog. The truth does not always want to come out. Sometimes, it must be grabbed by the tweezers and plucked from flesh and into the light. Only then can you see what was stuck inside for so long. Nina Covington’s exhibit will be on display through October 7th at abrasiveMedia. There is a closing reception with artist’s talk during the October crawl, 10/7 from 6-9 pm.